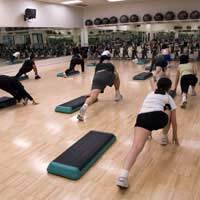 There are different types of aerobic classes available, water aerobics, step aerobics, dance aerobics to name just a few. One thing they all have in common is they areteacher led classes that are designed to work on all the various components of fitness. Classes are run by qualified instructors who will find the type of exercises that are suitable for you, teach you how to build up your fitness and importantly how to exercise safely. Some gyms have personal trainers available who will work out a training programme that is specific to your needs, and will supervise you throughout the training on a one-to-one basis. No matter how unfit you are, you can take part and benefit from a fitness programme supervised and designed for you by a qualified instructor. You will be placing a strain on joints like knees, back and ankles and sprains are likely to happen at some time when you are exercising. If they do, don't try to carry on regardless. Get the injury checked out. It may be you can continue if it only needs supporting, but sprains normally need rest to heal so make sure an appropriate diagnosis and treatment is made of the injury. If you haven't taken any physical exercise for quite some time, or are suffering from a medical condition check with your GP that it's okay before starting an aerobics class. Beginners should look for a class that is suitable for their level of fitness and ability. Make sure your aerobics instructor is properly qualified. Wear suitable clothing. You should wear loose breathable clothing worn in layers, so you are able to remove items as you work harder. Don't overheat! Wear the correct footwear. Shoes should have a padded heel collar, a flexible sole at the ball of the foot, strong arch support, and the heel should be the same width as the sole and be slightly raised. Unsuitable or ill fitting shoes can put excessive strain on joints like knees, ankles, and spine when jogging, or jumping, motions are being performed. Shoes should have proper cushioning. Don't wear shoes that are worn down at one side or at the heel. This can lead to you losing balance and going over and twisting your ankle. Don't do any aerobics on your own without having had some proper training from a coach or instructor. Incorrect posture, doing the exercises wrongly and unsafe movements can all lead to injury. Always train in a well ventilated room. Check any equipment before using it to make sure it's not defective and is safe to use. Don't train on a slippery or uneven surface. Warm up and stretch properly before starting your class. Eat regularly throughout the day. This will improve strength and stamina. Drink lots of water before exercising and have water on hand during the lesson to replace lost fluid. Don't exercise if you feel physically tired or feel any pains in your muscles. Exercising when physically tired increases the risk of injuries like sprains and muscle pulls. Aerobics is a great way of keeping fit and if you follow the tips given here it can be an enjoyable, safe and healthy experience. How Safe are the Martial Arts?